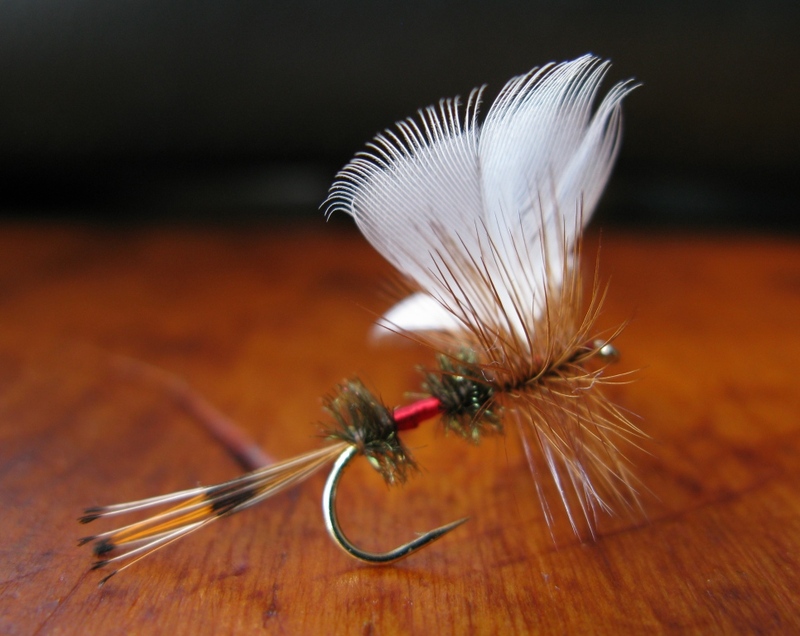 One of the earliest dry fly patterns that I had a real fancy for my fishing was the Fan Wing Royal Coachman. Ray Bergman had written of this fly numerous times in his books, recalling various accounts of its fishing success. At times the Fan Wing Royal saved the day for him when not a single other dry fly produced so much as a strike. Ray was initially a scoffer of the fly, thinking it ‘ridiculous,’ even expressing his disdain to the clerk who first showed it to him, asking, “What have we come to?” Before that fishing season’s end Ray Bergman had done a complete about-face, and became an angler who considered the Fan Wing Royal Coachman quite effective, though not always reliable, but sure enough in its ability to raise trout to the fly, often when nothing else brought results. Bergman’s first book, Just Fishing, includes several pages of Ray’s dissertation detailing his initial revulsion and outright condemnation of the fly, culminating with his observations of another angler’s success, followed by his own angling triumph that same day. 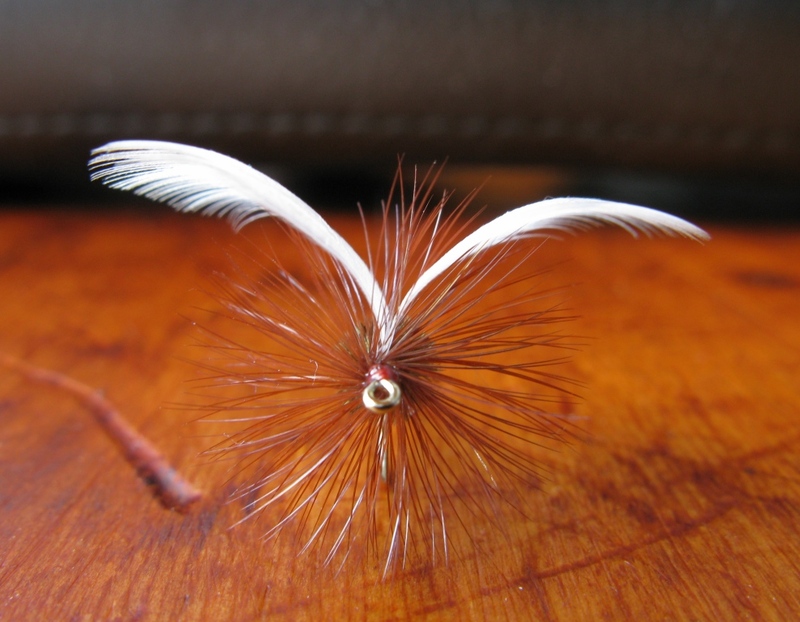 By the time he wrote his final book, With Fly, Plug, and Bait in 1947, fifteen years later, this ‘ridiculous looking’ dry fly had not only remained on the list of the author’s favorites dry flies in all three books he wrote: Just Fishing, Trout, and With Fly Plug, and Bait, but the Fan Wing Royal Coachman had become certifiably entrenched in first place as Ray’s favorite dry fly. Though he still admitted it was not always the most successful dry fly for all occasions. Actually now, if it were an infallible fly, wouldn’t that spoil all our angling fun? A dry fly pattern that would consistently and unfailingly work to catch trout, day in and day out, a pattern that never failed to induce rise after rise, and bring fish after fish to the net, would not that become boring indeed? I’ll tell just two stories of my success with this fly. The first one occurred on Lycoming Creek near Williamsport, Pennsylvania. I was not old enough to drive at the time, which makes this over forty years ago, but my brother Larry and I found fishing close to home by just walking out our back door and over the dike wall to the creek. Below the High Street Bridge there was a pool along the west side that dropped off from a smooth glide under the bridge into a deeper run along the bank. The entire shore was covered by rock rip-rap and overhanging trees, though not large, yet at about twenty to thirty feet they afforded afternoon shade over this spot. At the head of the pool was a huge rock, almost round, nearly half the size of a Volkswagen Beetle. The run was perhaps forty or so feet wide and over a hundred feet long. We caught rock bass, smallmouths, and chubs there on dry flies routinely, though none very large. One hot July afternoon, I was casting a size #8 Fan Wing Royal Coachman in this pool. I had caught a few rock bass along the lower section and when I arrived to fish the head of the pool, I made a cast above the big rock at the far bank. The Fan Wing looked beautiful as it floated along, and I thought, quite alluring to any fish that might be thereabouts, tipping slightly to one side as it bobbed on the current. As the fly floated about a foot away from the rock, all of a sudden an enormous splash engulfed the fly. Spray flew into the air, and the sound was so loud it frightened me, and my reaction was to strike so hard that the leader popped with a snap and the fly remained in what I realized must have been the jaw of a big bass. Of course I tied on another and tried again, but that was all she wrote for my chance of hooking a big fish that day. The other Fan Wing tale I’ll tell here is short. I was fishing a local trout stream in the evening, using an Adams dry, size #14. I took some fish here and there, probably eight or ten, and before long I mused to myself ‘this must be the fly for the evening.’ After fishing for about an hour I arrived at the first really nice, deep pool that I had seen on the stream. The Adams proved to be worthless at this location, but I figured there just had to be some trout here. The water just looked too good; lots of cover, it had a depth close to four feet, and there was a good riffle entering at the head. My change of fly had to be something to attract attention, so I tied on a #10 Fan Wing Royal Coachman. The first drift brought a fifteen-inch brown straight off the bottom of the pool. I can still see that fish in my mind. He raced to the surface, never slowing in his attack, and took the fly with a smashing strike. I didn’t lose that one though; he was hooked, landed, and released. In hindsight, I recognized, surely that trout had been watching my Adams bobbing along on the surface. The Fan Wing never had a chance. It is interesting to ponder, why the fish chose one over the other, the ridiculous over the sublime. The white feathers for fan wings come from a wood duck drake. I suppose domestic white ducks might also have these feathers, though they may be too large. I guess that is why the wood duck feathers are preferred. They used to be available in fly shops, sold specifically for fan wing patterns but like wet flies, some classic dry fly patterns too, have fallen into the fly boxes of yesteryear. Thread: White Danville 6/0 for the wings and body, finish with brown or black. Tip: Gold tinsel if desired. Body: Front and rear 1/3, peacock herl, red floss enter. 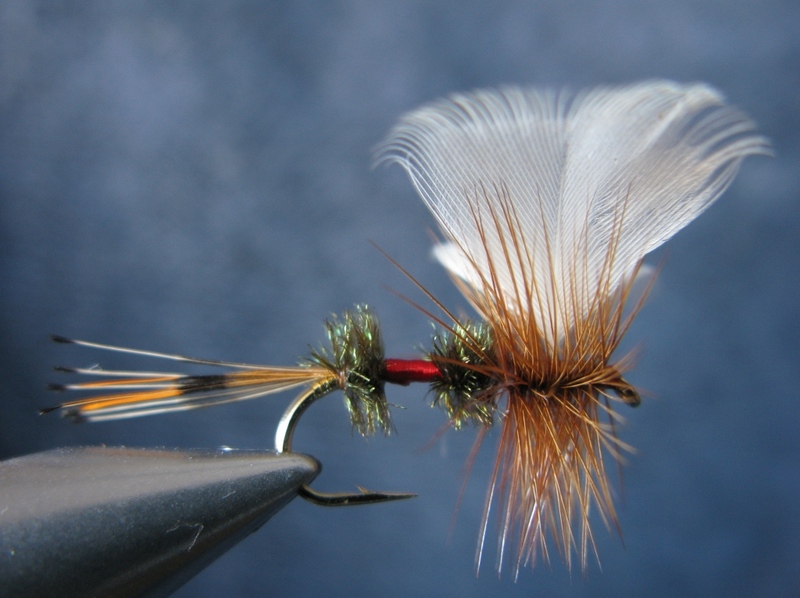 See also the original tied by Ray Bergman – Fan Wing Royal Coachman dry topic in the archives on this site. This entry was posted in Dry Flies, Fly Pattern Recipes. Thanks for the reply, and it is nice to hear from you! Been a while…the Blue Fan Wing Royal Coachman you sent makes perfect sense for imitating the blue damsel flies…I’d like to add your photo of those flies to this topic.